Using a standard-sized module can simplify the building design process. An even two foot module, for instance, is easy to plot on graph paper. This makes it easier to draw plans and calculate materials and costs. Another benefit of 24" earthbag modules is increased overlap between courses. 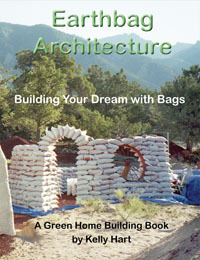 Many earthbag builders just fold over the ends of bags for expediency. This creates bags about 20" long and overlaps of about 5" assuming standard 18"x30" bags measured when empty. A 5" overlap is marginal in terms of creating a strong running bond. See drawing below. In many situations you'll want to use fewer bags to reduce waste and save money. You can do this by filling bags to capacity and sewing (needle and thread), stitching (galvanized wire) or pinning (nails or bamboo slivers(?)) bag ends closed. This saves bags, but also creates 24" long bags - a convenient sized module to work with - and 9" overlaps between courses for stronger walls. Maybe you don't want to spend extra time closing bag ends. Another way to get 24" long bags (when filled) is to buy longer bags. You can buy 18.5"x34" bags and fold the ends under. One supplier of these longer bags is Donald Davis Bags . Another advantage of the 24" module length is that this makes it easy to arrange vertical ties between courses of bags when creating a sandwiched bond beam with 24" intervals (see this detail). This makes 24" roof rafters convenient modules as well, which is a common spacing for some roofs.